Today I am participating in a little military spouse link-up hosted by two of my fellow military spouse bloggers, Jen and Amanda. This blog was started as a way to keep our family and friends updated on our adventures with the military, but I have found I do not blog as much about military life as I thought I would. I thought these questions were fun and would give me a little opportunity to touch base on this crazy lifestyle we have found ourselves in! 1. Tell us about yourself and your blog. For those who are new, the name's Chelsea. I am married to a Naval Aviator, Parker, and we are currently stationed on the east coast. We have moved a total of 5 times in less than 4 years, which is nuts to think about but just feels normal by this point. We are Christians, have two furbabies (Jenny and Darla), and have a baby daughter in Heaven. We also hail from the great state of Texas and can get obnoxious with our state pride. This blog chronicles every single bit of it. I am a very open book and love sharing our triumphs, heartbreak, and everything in between. 2. What branch of the military are you affiliated with? My husband is in the Navy. Hence the blog name, Anchors Aweigh. 3. What is one thing you enjoy about the military lifestyle? The moving. Some people tend to hate this part, but it's been so fun seeing different parts of the country and meeting people we otherwise would not have. If it weren't for the military, we would have settled down in Texas and never left. Getting to experience so many new places and people is a gift! Stay positive. Deployments, boot camps, training dets are going to happen, and you won't always get to go with them. I never want to be without my husband, but trying to see the separation through rose colored glasses makes a world of difference. We are gearing up for our first deployment experience, and I am busy making lists of goals I want to accomplish and ways I can better myself while he is away. I don't want him to leave, but I think it's important to make the best of it. Befriend your fellow military spouses. Nobody understands what you are going through quite like they do because they are living it too. I always say it's super easy to make friends in the military because we are all desperate for a buddy. We are pulled away from our family and friends back home and all need people to do life with in our new homes. Be open and make friends. Embrace it. You will either hate this lifestyle or absolutely love it. Sure, there are going to be hard times, but take the good with the bad and rock on. There are a lot of perks in the military lifestyle, and you will get so much out of it if you fully embrace the opportunities you have in front of you. So that's a little bit about me and our journey with the military thus far! We really love it! I never dreamed of being a military spouse and this was never the life I envisioned, but I wouldn't trade it for the world. LOVE your advice!! My husband is from Texas too, so I know all about that obnoxious pride. 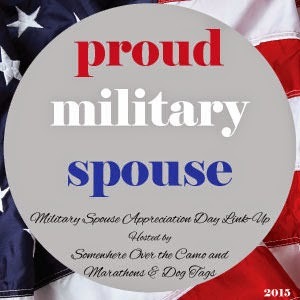 ;) Thanks for linking up with us today and Happy Military Spouse Appreciation Day! I completely agree about the moving! You get to see and experience places you never would have otherwise ended up! It's such a fun adventure. Plus your blog Chelsea was one of the first I found when moving to Pensacola and always gave me so much to look forward to! How cute is your layout! Nice to meet you! I 100% agree that staying positive is 100% necessary to thrive while your significant other is in the military. Great post! "You will either love it or hate it" - This is so true! There is no neutral territory of emotions when it comes to military life. Sometimes I might swing between the two in the course of a single day but most of the time it's love ;) Thanks for sharing! Hi! It's so true, embracing the situation is key to making the experience into a positive one! And nice to see some Navy spouses being represented! Thanks for sharing!